The 2019 BOLD Camp is scheduled for July 8 - 12, 2019. The 2019 BOLD summer camp taking place July 8-12, 2019 from 9am-3:30pm application deadline has concluded as of March 31. With the large number of applications received, we are only able to accept approximately 35% of the applications. Those accepted will be notified regarding their application status via email no later than April 30. If you have any further questions please feel free to contact the BOLD Team at BOLD@cinj.rutgers.edu. For information about additional precollege programs and camps offered at Rutgers, we encourage you to visit the Rutgers K-12 pre-college directory at precollege.rutgers.edu. High school aged students are invited to apply for the BOLD Camp (BioCONECT Oncology Leadership Development) - a unique summer learning opportunity for students who have an interest in learning about cellular biology and genetics of cancer, as well as the diverse careers connected to the field. During this week-long interactive experience, students will increase their understanding of cancer-related causes, diagnostic tools, treatment options and current research through the context of breast cancer. More importantly, they will identify risk reduction strategies and learn first-hand about diverse careers related to the field as they live the experience among the professionals at Rutgers Cancer Institute of New Jersey! Open to high school students entering the 10th, 11th or 12th grade in Fall. Application: The Application process has closed. Email BOLD@cinj.rutgers.edu or call 732-235-4160. The BOLD initiative is offered by the LIFE Center (Ladies Professional Golf Association In the FIGHT to Eradicate breast cancer) at Rutgers Cancer Institute of New Jersey and the Center for School and Community-Based Research and Education, Rutgers School of Public Health. Funding provided by the Val Skinner Foundation. 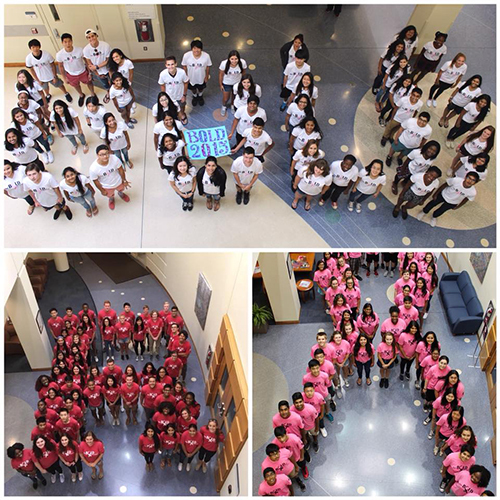 The BioCONECT Oncology Leadership Development (BOLD) Initiative is a summer camp experience that gives students a chance to learn about the development of cancer. View the video to see what it's all about!